The pretty Restaurant Koehler – Auberge du Cheval Blanc dining room. There are restaurants you want to like the minute you see them. 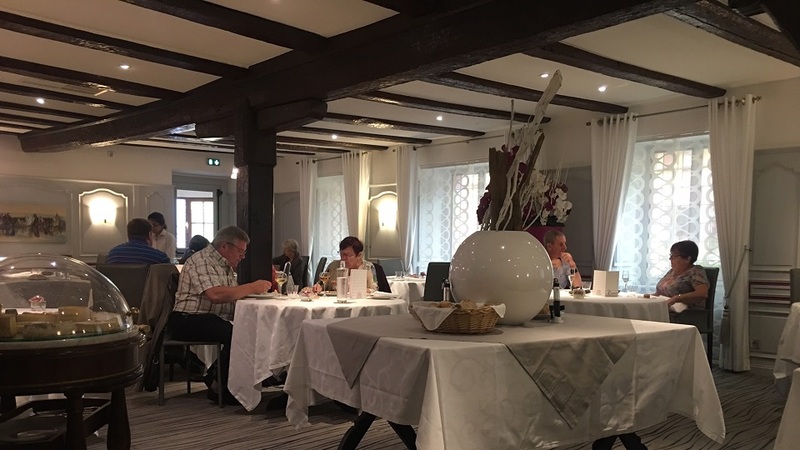 Restaurant Koehler – Auberge du Cheval Blanc, in Alsace’s charming little town of Westhalten, is one such place. Unfortunately, my most recent meal was less than impressive. The inventive and very tasty amuse-buche. That’s a real shame, because this pretty restaurant has so many things going for it. Run by the latest wave of members of the Koehler family, which traces its connection to the establishment back to the 18th century, the restaurant and hotel are located in a charming, old-looking house. During a recent weekday lunch, the place was packed, both at the long, bright bar counter and in the well-lit dining room. The latter is very spacious and exudes a welcoming, comfortable air, pleasantly combining rustic and chic elements, including exposed wood beams and well-appointed, refined-looking tables spaced generously apart. 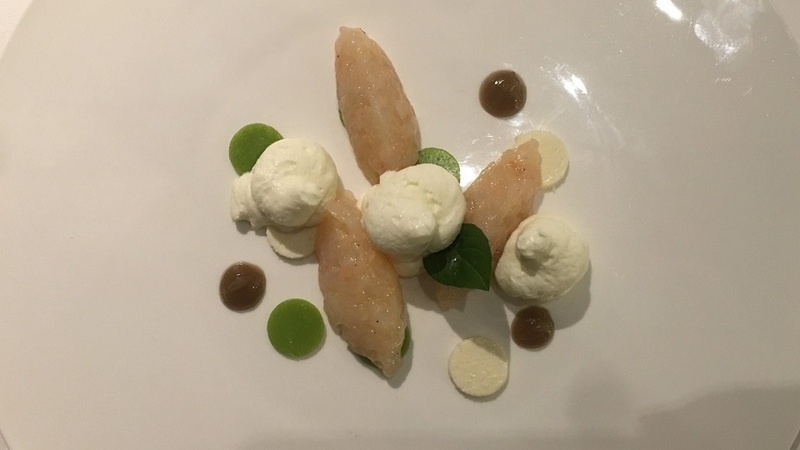 The patrons at Cheval Blanc usually include a mix of younger and older local farmers and well-heeled city people, suggesting that the restaurant appeals to many different age brackets, palates, backgrounds and mindsets – always a promising sign. Scampi tartare with small peas, horseradish, yuzu and scampi gel. The menu offers a reasonable number (“reasonable” as in not exaggeratedly and ridiculously large) of promising-sounding dishes, all of which mention mostly locally sourced French ingredients – missing are the star anise, abalone and black cod infesting the kitchens of the many highly-touted restaurants that all seem to work with the same ingredients flown in from afar. The menu also boasts a section of incontournables, or those dishes you really can’t do without (mostly foie gras, frog legs and a Grand Marnier soufflé). Another nice touch is that the menu names 27 different individuals, mostly farmers and breeders, who provide the ingredients used in the kitchen. And if all that wasn’t enough, prices are mostly reasonable (though at 41 euros, the frog legs seem too pricey). Further, kudos must go to the restaurant’s wine list. Simply put, it’s really enticing, with numerous wines offered at very fair prices and a smashing selection of – count ’em – 31 wines by the glass from all over France, a number of which are from old vintages and offered thanks to the Coravin system. Bio wine lovers will also appreciate the wines from estates that practice organic or biodynamic agriculture. Last but not least, there has been obvious effort and much attention given to sourcing wines from the local vignerons (those of the town of Westhalten and immediately surrounding villages such as Orschwihr). Marinated sardines, new onions, cucumber, basil and white balsamic reduction. 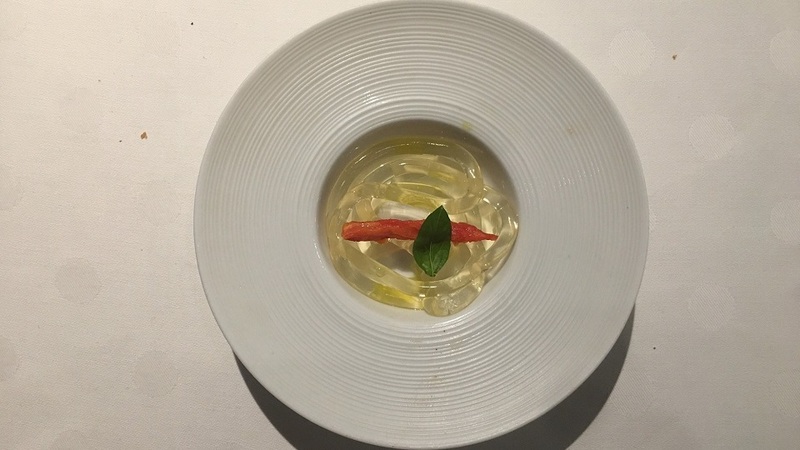 And yet, despite all of that, my latest meal at the restaurant was a truly terrible letdown. Food-wise, things could not have started off any better. The amuse-bouche was a wildly successful revisiting of an Italian classic, spaghetti, tomato and basil, in which a noodle had been imbued with tomato water; the glassy spaghetti-like strand explodes in your mouth with a riot of intense fresh tomato and basil flavors, providing a lovely start to the meal. Unfortunately, things went downhill from there. The scampi tartare and the snails were perfectly fine though not memorable, but the Simmental beef was too tough. 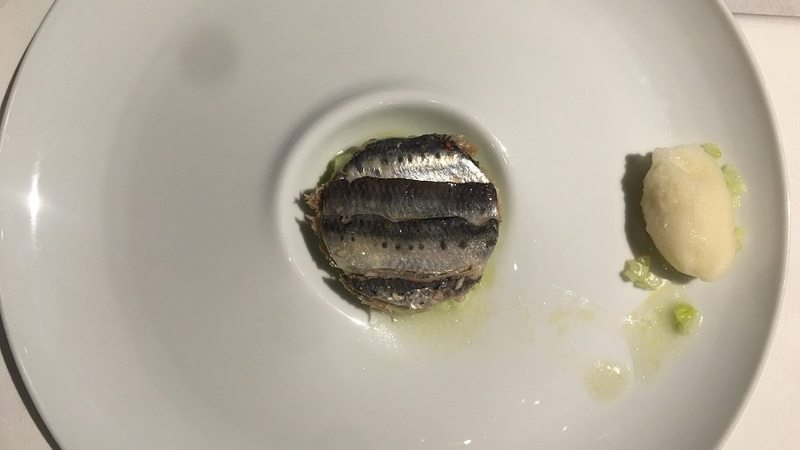 All things considered, the sardines were probably the best of the savory dishes I tried, but as they are an acquired taste, I’m not sure how many readers would enjoy them as much as I do. 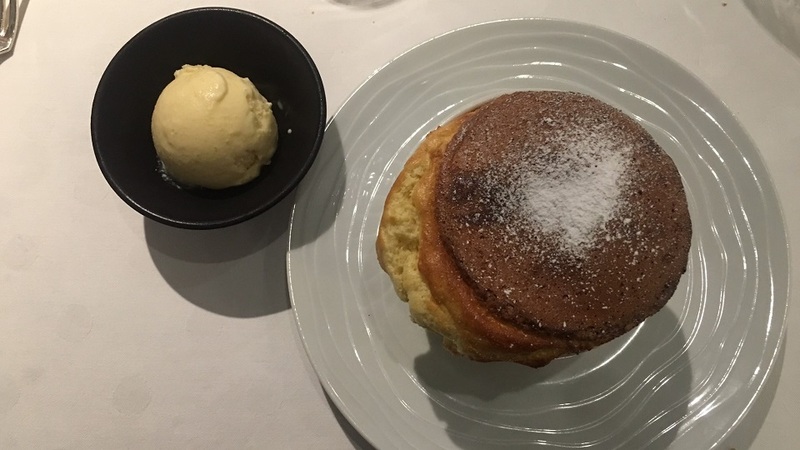 The Grand Marnier soufflé was also a little overcooked and dry. Simmental beef ribeye aged 21 days, mushroom sauce, vegetables, Espelette chili spice mix. 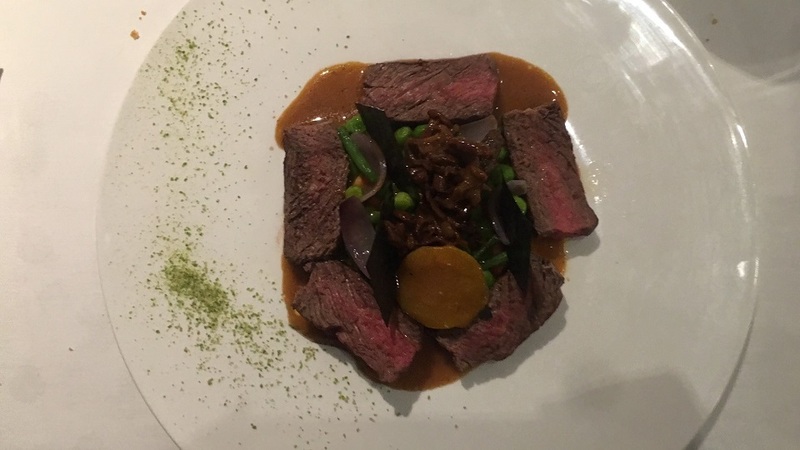 But the single worst thing about Cheval Blanc on this day was the inattentive service, which was extremely slow overall but harried when the food did finally arrive, making a so-so dining experience much worse. Granted, the place was packed to the rafters and there were many big groups eating at the same time (the restaurant proudly states that it welcomes big groups and wedding celebrations), but when the place is so mobbed, it would behoove the management to do something about the number of servers it employs; either that, or when groups have made reservations, refuse walk-ins and/or close down part of the restaurant. If you don’t have the staff on board (in the kitchen, too) to do a proper job, you shouldn’t be accepting so many diners at once. On this day, three different servers came to my table, none of whom were especially sure of what he or she was doing. It’s really too bad, for as I stated above, the restaurant offers many things to like about it. The very good wine list is certainly among these. I have nothing but positive things to say, especially about the wonderfully varied and long selection of local wines offered. This is precisely what I look for in wine country restaurants that give their patrons a chance to make many new discoveries. I like nothing more than to try the often true gem-like wines of little known local producers I never have a chance to taste. I started things off with the 2017 Schlegel-Boeglin Pinot Blanc, that makes a light-bodied, bright and flavorful (if not especially concentrated) aperitif. I actually went to visit the domain right after my lunch as it was only a brief walk away. It was fun to try the many other wines made there, an experience I would have missed had it not been for the Cheval Blanc’s helpful wine list. The estate is located in Westhalten right at the entry of Alsace’s Vallée Noble and benefits from a rather warm mesoclimate. All its wines offer mostly soft fruity charm, early appeal and an easygoing texture. A real step up in density and depth, the 2016 Camille Braun Gewurztraminer Uffholtz showcases the grape variety at its best: rich, luscious and varietally accurate, with grapefruit, rose petal and sweet spice aromas and flavors galore. This is a lovely wine from a well-regarded biodynamic producer in Orschwihr. The family traces its winemaking roots back to 1583! The 2014 Bernard Haegelin Pinot Noir Rouge d’Alsace paired well with the ribeye, providing a nice juicy Pinot Noir fruity contrast to the sweet meat fibers in the mouth. Like Camille Braiun, Haegelin is also located in Orschwihr and began bottling only in 1976, and has been farmed biodynamically since 2005. I was unable to go visit the estate this time around, but I hope to go visit sometime in the near future. 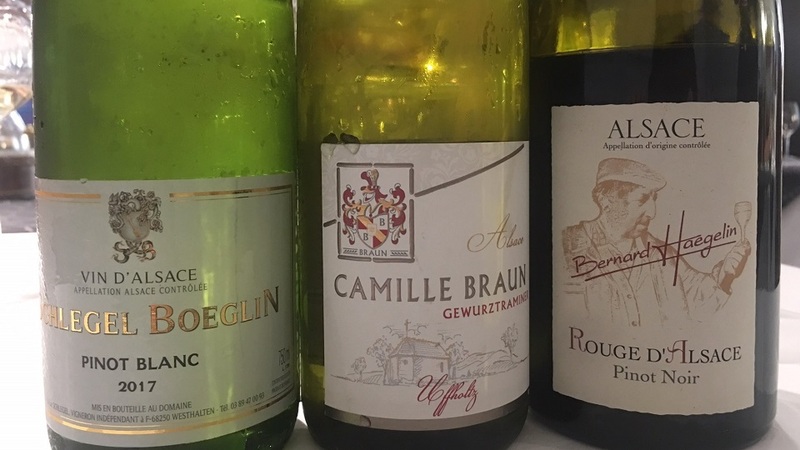 The wines I ordered were all brought well after I had emptied my plates; and toward the end, I waited so long to try a couple of Alsatian VT wines that I just gave up and asked for the check. I walked out of the restaurant disappointed. I’ve had better meals there in the past, and I’ll give it the benefit of the doubt and go again another time, since it wouldn’t be fair to pass final judgment based on this one negative experience (we all have bad days). But still. Given that nobody has money to throw around in these tough economic times, my suggestion to the folks running this restaurant is that they tighten up their ship.